Activists destroyed a vineyard. The sign reads, "Scientism: False solution for fake problems." The attack came at dawn and was swift. 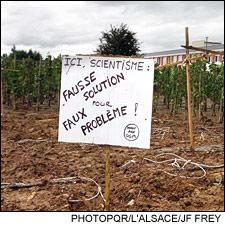 On Aug. 15, around 70 members of a French environmentalist group known as Les Faucheurs Volontaires—"the Voluntary Reapers”—infiltrated an experimental vineyard in Colmar, France, digging up and hacking apart some 70 vines with genetically-modified (GM) rootstocks, grown by the French National Institute for Agronomic Research (INRA). In the 20 minutes it took police to arrive, the Faucheurs inflicted about 1.2 million euros ($1.56 million) worth of damage to the taxpayer-funded research project, leaving an empty patch of dirt. The Faucheurs' attack erased seven years’ worth of research. INRA scientists had planted the vines as an experiment to combat grapevine fanleaf virus, a disease spread by infected plant material or microscopic roundworms that reduces grape yields by as much as 80 percent, kills vines, ruins soils and plagues virtually every grapegrowing region in the world. There is no known cure for the virus, but the GM vine rootstocks were implanted with a gene that is resistant to it. GM crops are controversial, especially in Europe. Proponents argue that inserting gene sequences into plant genomes can produce disease-resistant plants far faster than traditional cross-breeding programs. They also say that disease-resistant GM plants mean less need for fungicide and other chemical treatments that can harm the environment. Opponents argue that GM crops have not been sufficiently tested for safety, both in the field and on diners' plates. They fear that GM crops can pollinate and “taint” unmodified plants and could disrupt ecosystems. Additionally, many worry that major biotechnology firms, such as Monsanto, an American company that provides the majority of the world’s commercial GM seeds, will use the new crops to dominate global agriculture. The arrested activists included winegrowers from various other French regions and a local Alsatian winemaker named Jean-Pierre Frick. "Agriculture and wine are incompatible with biological PGM [Genetically Modified Plants]," Frick told Wine Spectator. "The French and Europeans are overwhelmingly against Genetically Modified Organisms. 'No GMOs in our fields, no GMOs on our plates,' they say. The neutralization of the 70 grapevines was an act of civil disobedience, which is a legitimate expression when the powerful impose on the population something it has largely disowned." Frick claims the experiment was more about corporations and public relations than science. "The vines GMO field test was more of a sociological experiment, to see how far a profession and a population were willing to perform tests designed to endorse the PGM," he says. Lemaire maintains that while more research is needed, GM vines hold the key to fighting off pathogens. Leading viticultural scientists agree. Noisette believes that many in France condone the methods of the Faucheurs, which claims 6,000 members. “It's a non-violent action,” he said. “The Faucheurs accept and, more, they want to be judged. For them, [a criminal trial] is the last way to be heard by the government." There is even a fund-raising organization to help the Faucheurs pay damages and fines, called Sans Gène. "The judges will do their work conscientiously," says Frick, "and the trial will highlight the inconsistencies of these tests, as well as the ravages of the commodification of life, and the common good of humanity." Because polls show public wariness toward GM technology, Lemaire and his colleagues are laboring to educate the French populace about their research, with radio and television appearances to emphasize the small-scale, non-commercial nature of their GM work. The institute has even opened a dialogue with environmentalist factions opposed to the research. INRA scientists recently met with a local steering committee representing the interests of environmentalist political groups, anti-globalization activists, organic farmers and organic winegrowers. We must be careful with our technology. Our intellectual ability to create technological advances has far outpaced our physical ability to evolve with these technologies. It is a big part of a trend to return to organic local produce. It removes the pesticides and some other advanced technology we have utilized to increase crop production. We must take the time to see the full impact of genetically altered foods on the rest of the life cycle. This can take generations, maybe more. It is analogous to the time traveler that goes back in time and changes one thing. The one change can impact many other things over time. I do not agree with the destructive methods of the activists. We must continue to learn and grow. We DO have an obligation to use our intellect to make wise uses of what we learn - not let emotion or money blind us to acting responsibly for the present and future generations. Perhaps, this type of experiment would be best performed in a country with less volatile activists.